Two county officials say they'll testify next week before a federal grand jury exploring allegations that the office run by high-profile Arizona sheriff Joe Arpaio has abused its power. The Arizona Republic reported on its Web site Thursday night that Maricopa County Manager David Smith and Assistant County Manager Sandi Wilson will testify Wednesday. 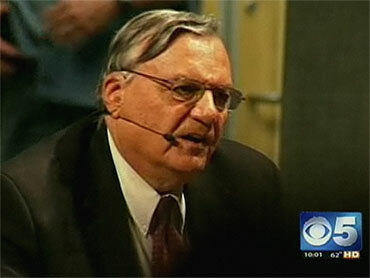 Arpaio gained national attention for aggressively cracking down on illegal immigration. He has sparred for more than a year with county leaders over allegations of corruption. In recent months, two elected supervisors and a judge have been charged by County Attorney Andrew Thomas after sheriff's investigations. Grand jury proceedings are secret, and officials at the U.S. Department of Justice wouldn't comment or confirm that an investigation is under way. Arpaio told the newspaper his office will continue its investigations but declined to comment further. His office didn't immediately return an e-mail message left by The Associated Press Thursday night.